One of my pictures is featured in this month’s Alaska Airlines Magazine alongside a blurb about Save the Redwood League’s Plant a Redwood Seedling program. 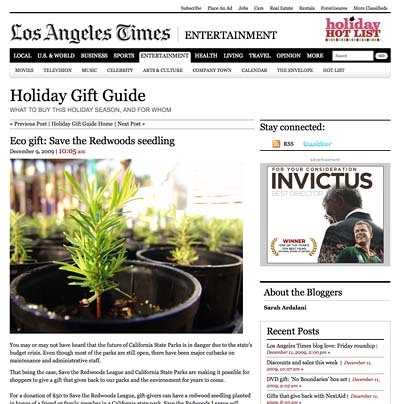 It was part of the magazine’s Holiday Gift Guide, in the section about cause-related gifts. I often take photos of events for SRL, where my wife works. Most of them are on Flickr, and a 2007 set from Mill Creek, Humboldt County, is where the seedling photo comes from. Thanks to the SRL folks for letting me know about the magazine, and letting me borrow their copy. The popular writer and director of “Buffy the Vampire Slayer” and “Firefly” fame recently received the 2009 Lifetime Achievement Award in Cultural Humanism, previously awarded to people such as writer Salman Rushdie and Greg Graffin of the punk band Bad Religion. The above five-minute snippet comes from his speech which was broadcast on the Cambridge Forum, but sadly their web presence is ridiculously antiquated (they offer cassettes of their programs, so that should give you an idea). A good article on the event (with pictures) is available from the Harvard Humanist(s): Joss Whedon Slays Sold-Out Crowd. 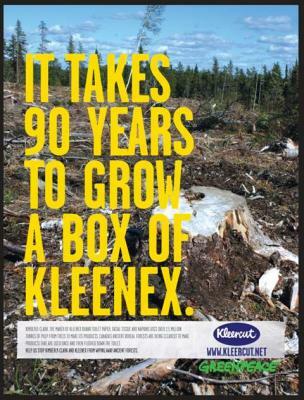 What’s in your box of Kleenex? Greenpeace offers a paper towel, napkin, tissue, and toilet paper buying guide that rates brands and gives data on post-consumer recycled content, overall recycled content, and whether chlorine is used to bleach the pulp. View it online, or download and print. They also have an iPhone app so you can look brands up while shopping. Okay, I admit it: I can’t help laughing at Jake and Amir. One of my favorite internet shows. 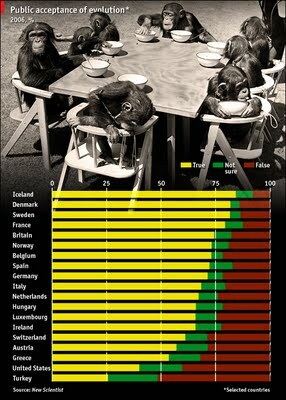 In a very cool infographic style. Who’s been naughty this year in the direct mail industry? ForestEthics has released its annual Naughty/Nice List, their report on the direct mail industry and who’s been playing nice in the past year (phasing out their print catalogs, for example), and who’s been naughty (being secretive about the source of their paper, for example). 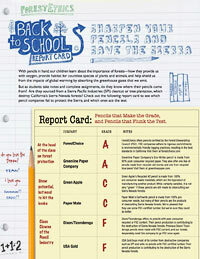 Does your pencil manufacturer get an A or an F? Maybe you don’t even use pencils anymore. But millions of schoolchildren have been heading back to school this month, stocked with packs of brand new pencils. Most pencils are made from unsustainably harvested wood. 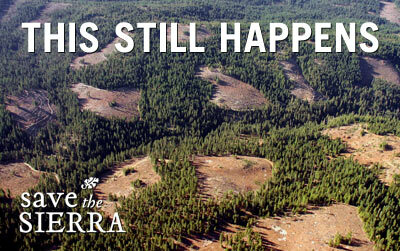 Worse yet, many are made from some of the most endangered forests in the West, the Sierra Nevada. But there are alternatives. Sierra Pacific Industries plans to cut down a million acres of California's forests in the next 50 years. SPI is one of the biggest landowners in California and owns most of the forest lands in the Sierra. Our forests are not all parks, like most American believe. SPI has one of the worst environmental records of California's logging companies due to its years of clearcutting practices and steadfast resistance to adopting to a more sustainable forestry model. ForestEthics is applying pressure to Sierra Pacific and you can help. While individuals now pay 42¢ to mail a regular letter, direct mail marketers have once again been granted a much lower rate by the government bureaucrats who make up the rules. It costs just as little as 14¢ to mail one of those credit card offers you got twelve of yesterday. ForestEthics.org believes junk mailers shouldn't be rewarded for invading our privacy and destroying the environment. Less than 10% of Canada’s Boreal Forest is protected. 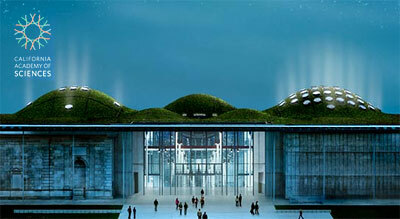 It is being logged at a rate of 2 acres a minute, 24 hours a day, to make things like catalogs and junk mail. The Do Not Mail campaign has collected over 40,000 signatures since March. If you haven't made your voice heard yet, do it now. Unless you're a big fan of junk mail (I suppose there's someone out there like that) you may want to sign ForestEthics' petition to create a Do No Mail Registry that would work like the existing Do Not Call Registry. An astonishing 100 billion pieces of junk mail are delivered in the U.S. each year, accounting for one-third of all the mail delivered in the world (!). And guess whose forests are being cut down to make all that crap you just throw away? Two weekends ago I was at Compostmodern, a one-day conference put on by the AIGA about sustainability and the design industry. I chatted for a while with the reps for the great paper company New Leaf Paper, and I asked them if they'd ever heard of Arbokem paper, which I'd used back in 1997 and '98 for some clients and for Bay Area Action's letterhead. Arbokem's little-known Downtown Paper line was one of the best alternatives on the market back in the late '90s, and that's saying a lot. 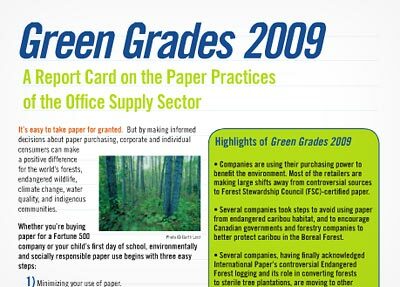 That time was pretty much the beginning of recycled papers' popularity, but almost no companies processed chlorine free and very few paper lines were 100% post-consumer. But Arbokem's Downtown line was even better. It was 45% wheat straw (agricultural waste that would ordinarily be burned and cause air pollution), 42% post-consumer recycled paper, and 12% calcium phosphate, which whitened the paper without the normal chlorine bleaching process that causes cancer-causing chemicals to be poured into our streams. Tonight I was thinking about the paper again and I Googled Arbokem to see if it's still around. Sure enough, the company is, and apparently they do all sorts of other obscure R&D, but it looks like the paper is not produced anymore. Shame, it was a great alternative. Incidentally, while Googling Arbokem I came across this 1997 article from the Palo Alto Weekly that I'd never seen, which mentions my use of Arbokem (look for "Western Front Graphics," my old company name, about two-thirds down). "The Story of Stuff" is a 20-minute history lesson and an economics course all in one, but it won't put you to sleep like your professors did. 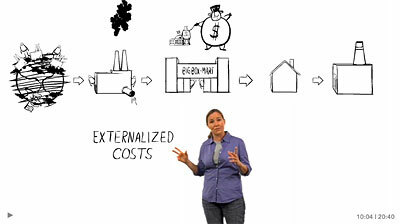 It's a fast-paced, fact-filled look at the underside of our production and consumption patterns and was produced by Free Range Studios, the same folks who did "Store Wars" and "The Meatrix." I’ve been compiling this list for over a year and finally decided to post it. It’s an ongoing list, of course, and I’d love to hear of any other suggestions from people, or your thoughts on these books. UPDATE MARCH 2010: Added the recently-published Tree Spiker to the list. espd’s rating: This is an error-riddled hit piece published by a right-wing publishing house. Don't bother unless you really want your collection to be all-inclusive. espd’s rating: I haven’t read it yet. 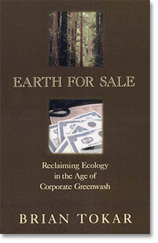 While this book doesn’t relate directly or entirely to Headwaters alone, Roselle was a co-founder of Earth First! and the memoir covers Headwaters-related territory such as Redwood Summer and the bombing of Judi Bari and Darryl Cherney.